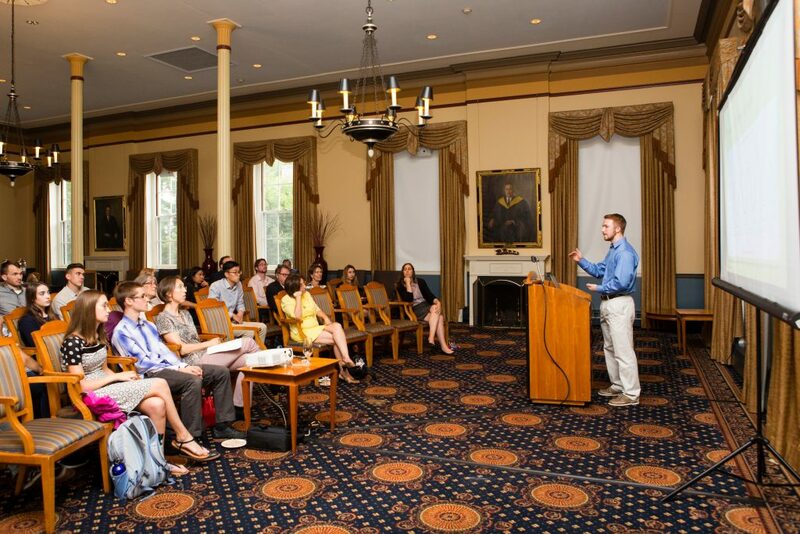 On Friday, July 14th, Tufts administrators and lab representatives met in the historic Coolidge Room of Ballou Hall, to celebrate and share their ongoing sustainability efforts. 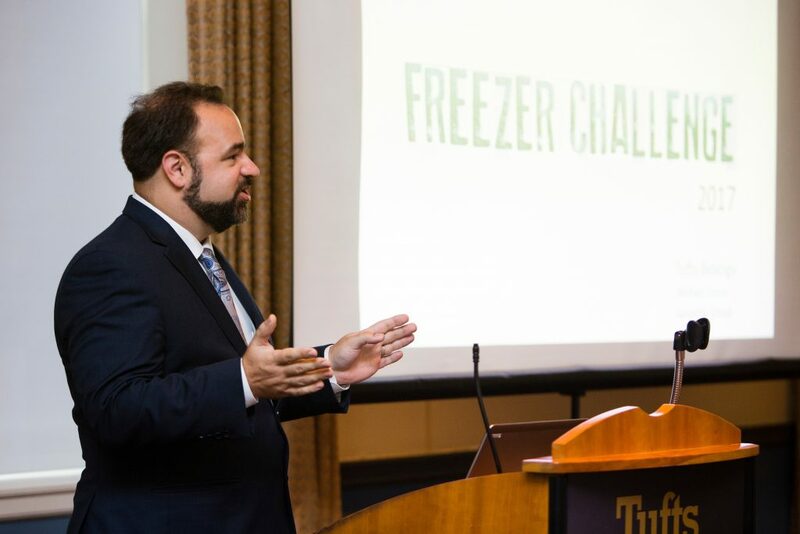 The event marked the culmination of the North American Laboratory Freezer Challenge, an international energy-saving initiative sponsored by My Green Lab and I2SL. 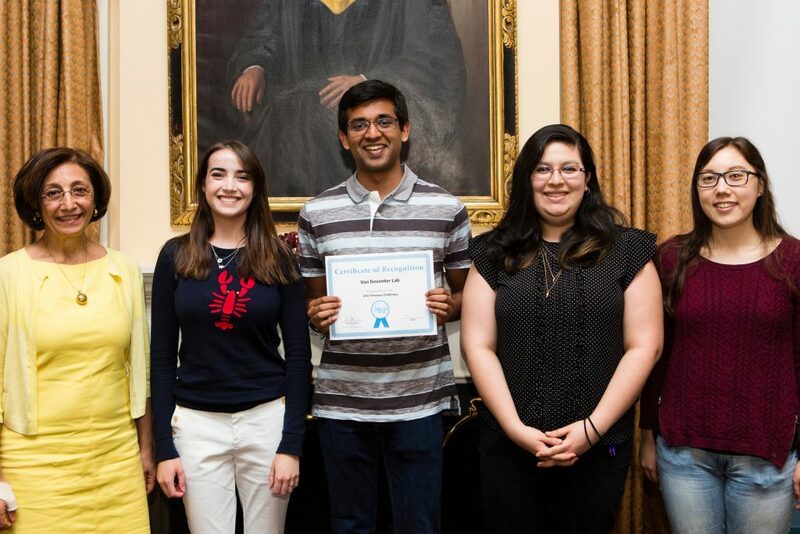 Several Tufts labs had participated in this challenge and taken major steps over the prior months to reduce their energy use. The Freezer Challenge was just one component of the overarching Tufts Green Labs Initiative, aimed at reducing the overall environmental footprint of lab spaces. 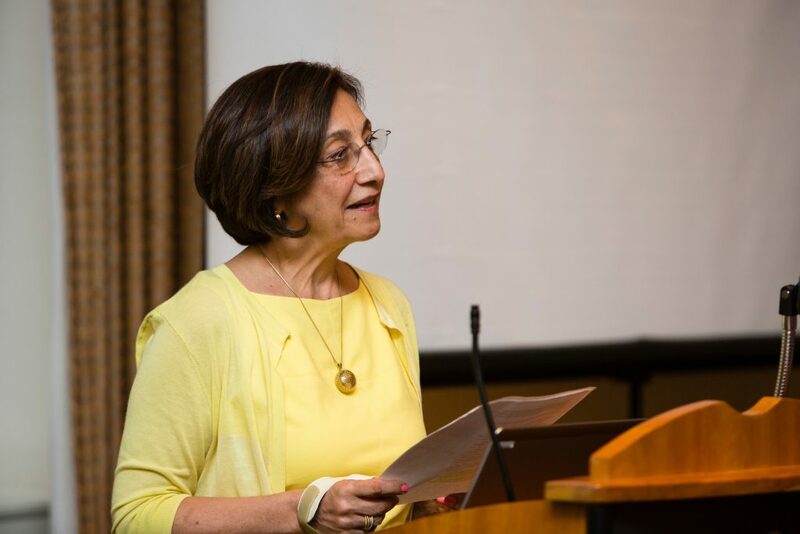 The event opened with the introduction of Dr. Meydani, the Vice Provost for Research. Tina Woolston, Director of the Office of Sustainability, presented certificates to the Tufts labs that participated in the Freezer Challenge: the Nair Lab, the Van Deventer Lab, and the biology labs at 200 Boston Ave.
Next, Michael Doire, the biology department manager, gave an informative presentation on the details of the freezer challenge and discussed the extent of lab energy use. A single ultra-low-temperature freezer demands as much power as a typical home, and for some universities, lab spaces require as much energy as all other operations combined! Therefore, implementing efficient technologies and practices not only increases sustainability, bus also greatly reduces operating costs for the university. The following three student presentations reinforced the idea that lab sustainability makes sense economically, as well as environmentally. Emma Cusack, an undergraduate student studying mechanical engineering, presented her work on a “Shut the Sash” initiative. Chemical fume hoods, which operate continually to remove dangerous fumes from lab spaces, are some of the most energy-intensive devices at Tufts: a single fume hood draws more energy than three average homes. Emma discussed how shutting the protective sash on these hoods has the potential to greatly reduce energy costs, since less air is drawn through the system – by the end of the 2017-18 academic year, her proposed campaign aims to reduce the average height that fume hoods are left open by 25%. 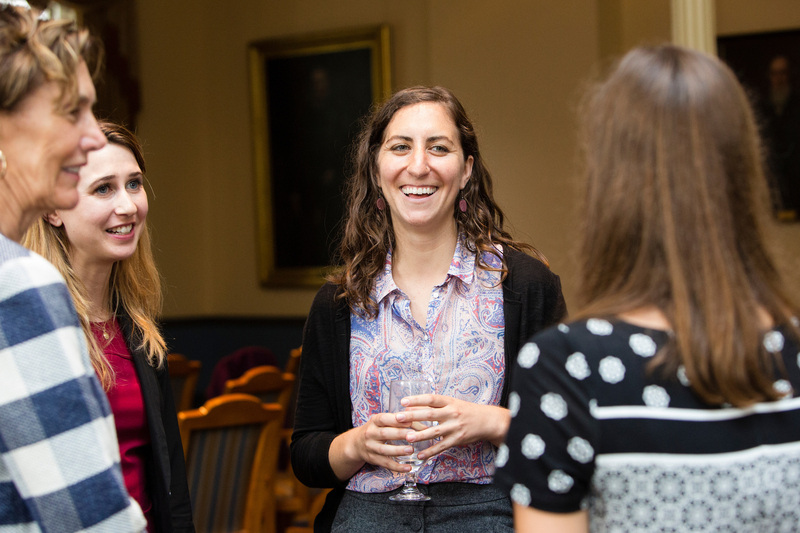 By implementing a campaign to educate students and faculty about these benefits, Tufts could save hundreds of thousands of dollars in energy bills each year, while greatly reducing greenhouse gas emissions. Next, Patrick Milne, an undergraduate chemistry student, presented his research on energy use for heating and cooling in the Pearson building. He described how improvements to the building’s heat recovery system would result in significant energy savings. He also proposed removing specific fume hoods that get very little use, but are still running continuously. 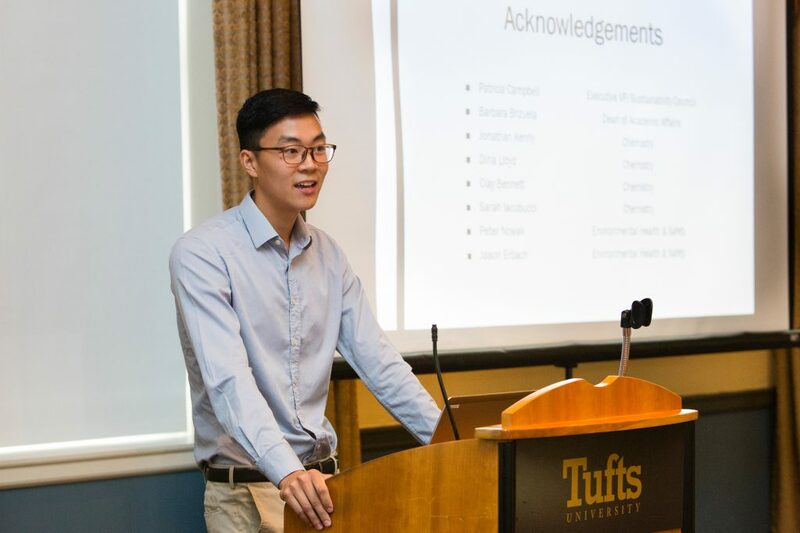 Finally, Jonathan Ng, another undergraduate chemistry student, presented his research on solvent use at Tufts. Solvents are hazardous chemicals often used in lab settings, and they present significant financial and environmental costs. Safely disposing of solvents can cost two to four times as much as their initial purchase cost; Jonathan described a single Tufts lab that spends tens of thousands of dollars each year on solvent disposal alone. He discussed how flash chromatography, a tedious and chemically intensive process, can be replaced by a machine that minimizes solvent use and saves time for researchers. Although the machine is costly, it would pay for itself in one to two years, and would save an enormous amount of money in the long term. 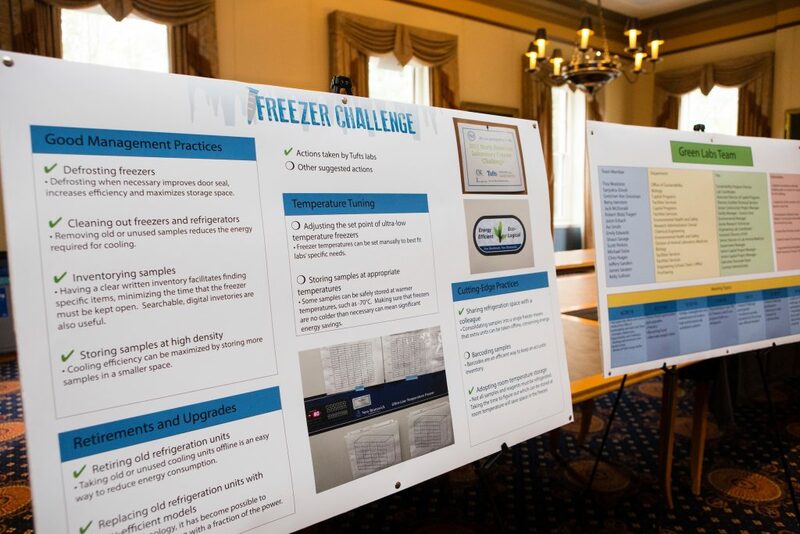 After the presentations, guests were invited to mingle and view posters with information on the Freezer Challenge and other green labs initiatives. The official Freezer Challenge has come to a close, but now is a great time to try it on your own! 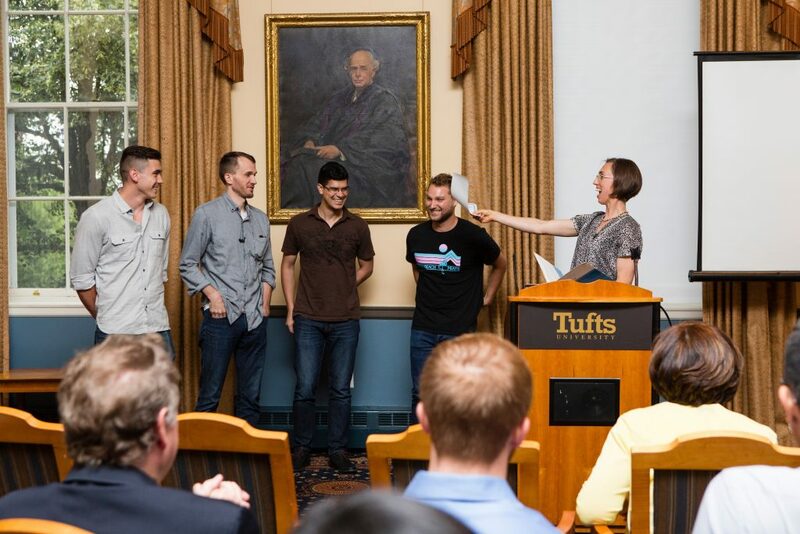 As Tina Woolston pointed out in her closing speech, “Actions taken by students and employees help contribute to a lasting culture of sustainability.” If you are involved in lab work at Tufts, please consider taking steps to make your lab more sustainable. You can read about best practices for freezers, or visit our website to learn about other Green Labs initiatives at Tufts. 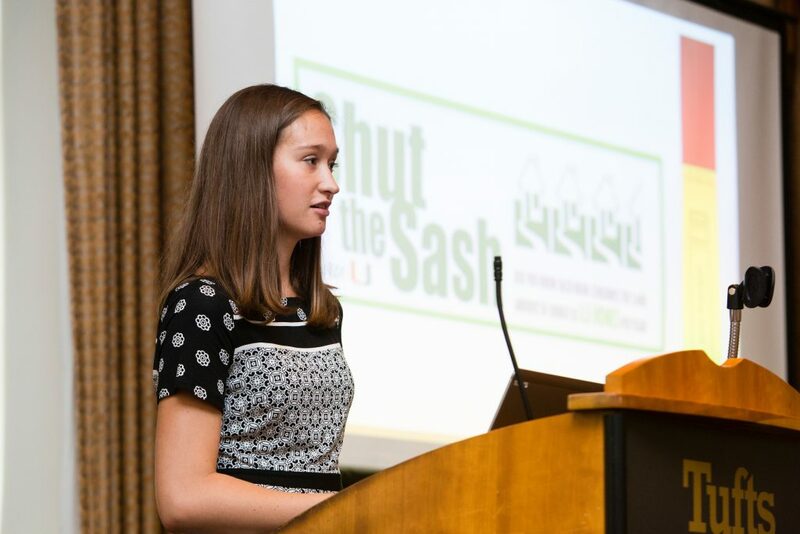 For an overview of the Shut the Sash campaign, check out the video below. If you have already successfully implemented sustainable practices in your lab, please share them in the comments!